Verdi's gift--among others--was to find the personal in the political. The political plot of Don Carlo is about the power of the Inquisition over the King in sixteenth century Spain. We see the Inquisition burn people at the stake, and we hear of misery and mayhem in Flanders where Philip also rules. But it is the personal that wins our hearts. My sense of this opera is that it does not work at all without the Fontainebleau scene at the beginning. In order to understand the characters we need to see Carlo and Elisabeth fall in love, to be young and impulsive, before we can grasp what happens to them. Hearing about it isn't enough. The amazing thing about this opera is how every character is fully realized, with individual hopes and fears. We see the power of Philip II, but we also see his sadness that his wife does not love him. We see Elisabeth torn between her love and her duty. We see Rodrigo's friendship with Carlo while he defends the king against him. We see Eboli's plot to destroy the queen and her later regret. Finally we see Carlo trying to rise above his fatal love. All this detail also makes it Verdi's longest opera. Don Carlo exists in the largest number of versions of any Verdi opera. It was written for Paris where the audience has to be out in time to make the train home. Having once missed the last train in Paris, I know well what grief this can cause. So things are put in and then taken back out. Then it was translated into Italian, and the whole process started over. It is a long, somber and ultimately very beautiful opera that grows on me with repeated viewings. Perhaps it is the wonderful performances in this Met production that win my heart. The only interview that survived the encore cuts was the one with Roberto Alagna as Carlo. His only aria is in the often cut Fontainebleau scene, but he has many wonderful duets with Eboli, Rodrigo and Elisabeth. Would we want to miss where Roberto says duets are like making love, and host Deborah Voigt looks at the camera as if to say "He went there?" Priceless. Whatever he's doing works for me. Marina Poplavskaya's Elisabeth is warm and inward. We see her impulsively fall for Carlo while remaining true to the unloved Philip. Ferruccio Furlanetto's Philip remains a magnificent triumph. Keenlyside wins for acting, but Anna Smirnova not so much. Many hold Don Carlo to be Verdi's greatest opera. It lacks a certain flash that we normally associate with Verdi, but it wears very well. The last scene was accompanied by the 10 pm fireworks at the nearby State Fair. 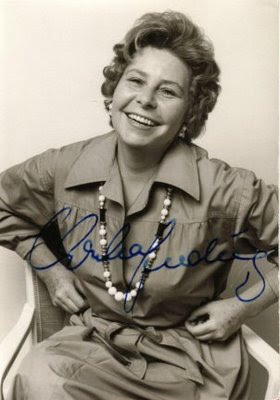 I have long been a fan of Christa Ludwig, and these are three pieces I love. You simply cannot know how much it means that I would show her singing Brahms. Everything she sings comes from a deeper place. My heart leaps. Doch. Die Liebe wirt's erreichen. Most rubato in Beethoven I've ever heard. PS. You know you actually speak German when you think of a saying "doch." I'm reading Christa Ludwig's autobiography In My Own Voice, and she makes the most amazing statement. She writes about makeup artists, especially admiring the ones at the Met, and then says that in modern German productions no one wears any makeup. The singers apply their makeup when they prepare to go home. Oy. She writes about the things I would want to read about. Christa Ludwig's book is dedicated to her mother, and the dedication is a list of wise sayings from her mother. I, of course, am most attracted to the wise sayings about vocal technique. "Breath, vocalization, and overtones are the pillars of good singing technique. Everything else comes from differences in body structure. Different cavities resonate differently from person to person." This is really all there is to singing technique. Controlling the breath controls the vocalization, which is really the smallest part. It controls the tessitura and registers. You only need to have heard the unresonated voice once to recognize this. Everything else is resonance. "Never strive to sing loudly. Only aspire to make a beautiful sound. Practice singing every note smoothly from pianissimo to forte, and back, at least forty times every day." Does this remind you of something? It should. It's the short version of my chapter on the messa di voce. I am amazed. It is so cool to read this. If you were attempting to boil it all down, you could hardly beat this. "Singing is spiritual. Physical technique is the base, but you must also be in spiritual harmony with yourself and with your surroundings." And, "Love must flow from you when you sing." She writes what I would want to read--the parts that give her joy, the parts she loves. She calls herself "we Austrians," though she is certainly German. "In Vienna, all that's wanted is bread and circuses--or rather pastry and opera." I've read singer autobiographies before, but never one written by someone who was so passionate about opera. Charlie Chaplin, and a lot more celebrity types, wrote an endless "and then I met" name dropping list. Christa writes about the business. I've started to think I'm channeling Christa Ludwig, we think so much alike. If you read nothing else, read "The Greatest Artists are always Searching." She likes any staging as long as it "doesn't distract from the music." What have I been saying? She then goes on to complain about various stagings, but I think this is a German perspective where everywhere they have regie theater. I would enjoy seeing a Despina that tends bar. I think. She says, "I believe that a talented interpreter not only has the right, but the duty to always examine and create a piece of theater anew." And then she goes on to quote Goethe: "...individuality of expression is the beginning and end of all art." I have always loved Goethe. Singing is above all else an act of creation. She calls the score the "golden bonds" from which and through which art is created. She urges singers not to imitate but to create their own art. She tells us that Herbert von Karajan thought there was no absolutely right tempo. The pulse and the tempo are related. It is part of the individual interpretation--whatever flows for you is right for you. Oh! "A professor teaches and an artist searches." What could be cooler than that? We part company only in her criticism of original instrument orchestras, a phenomenon I have been slow to understand. I think the same movement that wanted original instruments also has resulted in far more ornamentation in Baroque styles these days than was the case in my youth. Unless you're talking about Marc Minkowski who only wants the da capo sections to be sung sotto voce. Bah! The idea of individualized ornamentation is one of the most powerful trends in modern opera performance. I guessed what this is. Can you? It's July. I almost forgot. If they are going to call her the Beyonce of opera, then I will have to include Takesha Meshé Kizart in my sexiest list. As for the rest of the list, I'll get right on it. I spotted the microphone on both of Natalie Dessay's costumes last night at the rerun of La Fille de Regiment. The entire 2 1/2 hours was smile worthy. For some reason I am enjoying the comedies most. The picture is a double exposure of the ad for La Traviata. This is a recent essay by Anthony Tommasini in the New York Times about the difference between opera and musicals. He proposes that the difference is part of the old words vs music argument. In opera it's the music that is most important, and in musicals it's the words. I guess. Of course, opera isn't a single monolithic medium. I would like to suggest that like everything else, opera is organization driven. An opera company is a bunch of symphony players, singers and dancers all contracted to present musical theater. They are all going to be classically trained, and therefore are going to be expected to present things that suit their training: operas with a lot of heavy singing and traditional sounding orchestral accompaniment. If you went and there was a pit band with synthesizer and miked mumblers singing, you would not be happy. I find it interesting--I find a lot of things interesting--that the Zurich Opera has two orchestras: one for standard romantic repertoire and another for baroque and classical opera. They don't assume like everyone else that opera is all one thing. If you are like me and think opera is about singing and not actually about either words or music, the thing that would tell you you were at a musical would be the presence of microphones. We suspect that microphones are creeping into opera, too, but opera companies are more shy about showing it. The gray hairs that make up the majority of the audience for opera do not want amplified sounds destroying what little is left of their hearing. What Tommasini is saying is that people trying to cross over from musical to opera do not succeed because the music they are creating is simply not good enough to stand up to comparison with Verdi and Wagner. He would have them give up and stay on Broadway. I think I might suggest they try harder. The heavy hitters like Adams and Glass aren't necessarily doing that great a job either. My strictures would be different. Number one for me would be, "If you don't love at least one opera singer, don't write an opera." And if you do, write one for him/her. Preferably her, but we'll take what we can get. That's exactly how Benjamin Britten became the most successful opera composer of the modern generation. I haven't taken the 30 day opera challenge because I don't tend to think of music as consisting of favorites. However, I know that when I was younger and people would ask me what was my favorite, I would unhesitatingly answer: the "Erbarme dich" from the Bach St. Matthew Passion. It comes at the place in the passion where Peter has denied Jesus 3 times, exactly as Jesus had said he would, and now he pleads for forgiveness. On YouTube there is much discussion about the tempo in this version by Marian Anderson, but for me it is exactly perfect. The violinist is Joseph Fuchs, and the conductor is Robert Shaw. I once did a harmonic analysis of it, and it's incredible. I have always loved this piece beyond loving. Overlook the flaws of the recording and allow it to sink into your soul. 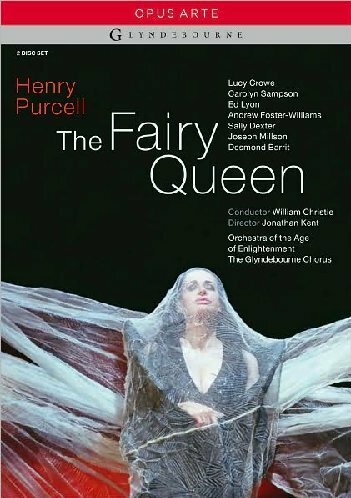 This DVD of Henry Purcell's The Fairy Queen from Glyndebourne, 2009, with William Christie conducting is a treat. Actually, it's my first experience of the English masque, a form that does not survive into the present. A theater like the Ulmer Theater could have done it, I suppose, but it would have taken all the employees and maybe a few outsiders. There is a full cast of actors who basically present Shakespeare's A Midsummer Night's Dream. Then there is a full orchestra, dance troupe and group of singers. One aspect of the ensemble we could not have duplicated: their astounding physical beauty. The acting troupe who perform Pyramis and Thisbe were middle aged men, as usual, but everyone else was slim and gorgeous, including Adam and Eve dressed only in carefully placed fig leaves. You could honestly not tell the dancers from everyone else. You know this never happens at the opera. The costumes were confusing. The fairies were dressed in black. Theseus was in 1690's attire. The lovers were dressed in a kind of romantic 30's look, while some ladies appeared dressed like 50's housewives. 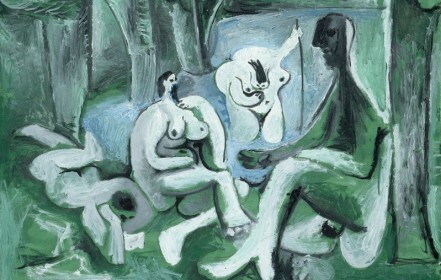 The beautiful naked pair put on clothing that made them look like hippies. You just have to go with it. The masque is a rather formless form. Perhaps plays without music were no longer as popular as plays with music. In opera with spoken dialog, the dialog replaces the recitative of Italian opera. Here Shakespeare's lines are left spoken, and the added music is all to added text. It's just anything with dancing and singing, like Adam and Eve and people in bunny costumes. Apollo appears briefly, as well as spring, summer, fall and winter. The actual plot is all spoken. We of the more formal operatic tradition are frowning and looking down our noses. 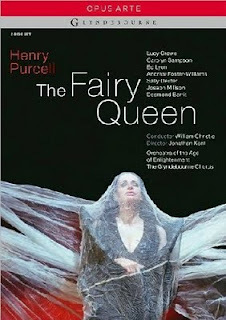 I have long been a Purcell fan, and William Christie is a great representative for him. I think the arias are more florid than I expected, and filled with dotted rhythms. I love the middle baroque. Things are not quite formed, not quite slicked up as they are in Bach and Handel. The effect for me is one of unique freshness and charm. So we should just lighten up and enjoy it. Recommended. This is Elisabeth Schwarzkopf and Herbert von Karajan doing the great aria "Porgi amor" from Nozze di Figaro. Why do I post this? She slides on almost every note. I have never heard anything like it. And it never feels like too much. It is very important to know that these things exist. This woman, Valentina Naforniţă, has recently won the Cardiff singer of the world competition. Yes. She does seem to get it. Buona fortuna. They took down the other one so I'm posting this one from the Met. The version from SFO is better. This is the only Ring cycle I have ever seen. Listening to him now krieg' ich Gaensehaut. I ask you--is it any wonder I never want to see another? This was his very first Wotan. It's like witnessing the birth of a god. Then in Siegfried and Goetterdaemmerung came Eva Marton still in her prime. What Wotan is supposed to sound like.